The Miniature Poodle are Poodles that have been bred down to a smaller size. They are smaller than the Standard Poodle, but not as small as the Toy Poodle. Though these dogs have been formally separated into these three categories, they are all considered to be of the same breed and subject to the same standards according to the American Kennel Club (AKC). According to legend, the Miniature Poodle was originally bred to assist in truffle hunting over 600 years ago, then quickly gained popularity as a lap dog amongst the European upper-class. With their instantly recognizable appearance, exceptional intelligence, and friendly attitude, these dogs have remained among the most popular breeds since those times. The AKC classifies the Poodle as a Non-Sporting Dog, and the Miniature Poodle variety is perfectly categorized this way. This decent guard dog is a great companion for first-time families, homes with kids and apartment dwellers too. 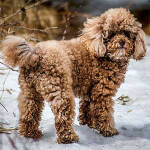 While Miniature Poodle information and facts are somewhat the same as the varieties that bookend it, you should still understand the qualities and concerns listed below. The Miniature Poodle is a small sized breed. 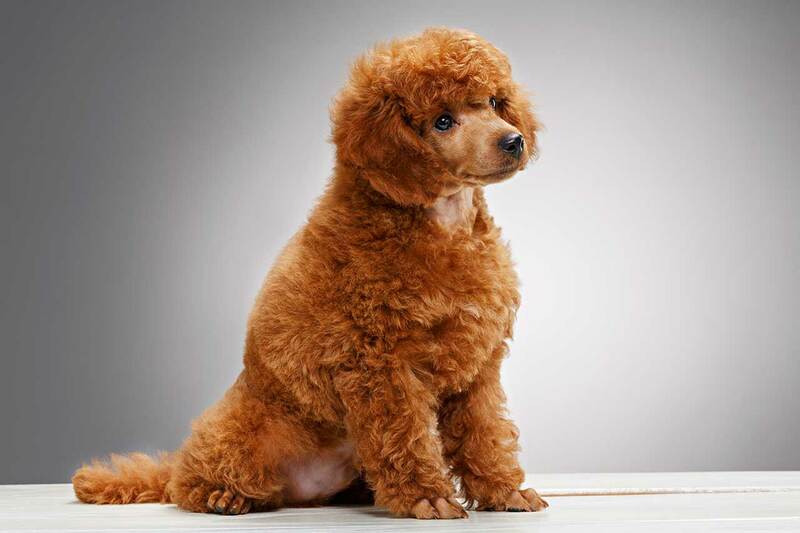 The American Kennel Club categorizes these dogs as Poodles between 10 and 15 inches in height. You can expect an adult to weigh between 12 and 18 pounds. Their small size makes them ideal apartment pets. These dogs are very social and well-mannered. They are great with kids and families and should have little issues with other pets provided that proper socialization takes place. 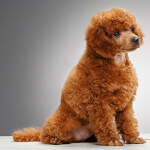 The Poodle is generally considered to be one of the higher maintenance breeds, if not the highest maintenance. The coat will require frequent brushing and trimming, and baths will be necessary to keep it healthy and clean. Exercise needs are moderate. The Poodle is an ancient breed dating backing at least 2000 years. 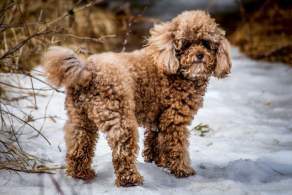 There is still debate as to when people began to breed these dogs to be smaller, eventually creating the sub-breed that we now know as the Miniature Poodle. The most widely accepted theory is that these dogs began to first be seen around the 1400's, when English or German truffle hunters found that smaller versions of the Poodle were better suited for the job of scenting and digging up truffles due to their smaller feet. It was not long before these dogs became popular amongst the French and English bourgeoisie, who enjoyed the breed for its elegance and intelligence. The Poodle gained acceptance to the Kennel Club in England in 1874 and the American Kennel Club in 1886. The Poodle has a square frame and carries itself with confidence. It should move with a light, proud, and bouncy gait. Though these dogs may look frilly, they are of working class background and should be muscular and robust. The coat is curly, coarse and dense. The Poodle is known for its flashy hairstyles such as the English saddle, Continental, and sporting; these clips, however, are unnecessary if the dog is not being shown. The coat comes in a wide variety of colors, including black, white, gray, silver, brown, blue, light brown, apricot, and cream. 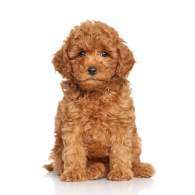 The Miniature Poodle is a small sized breed. 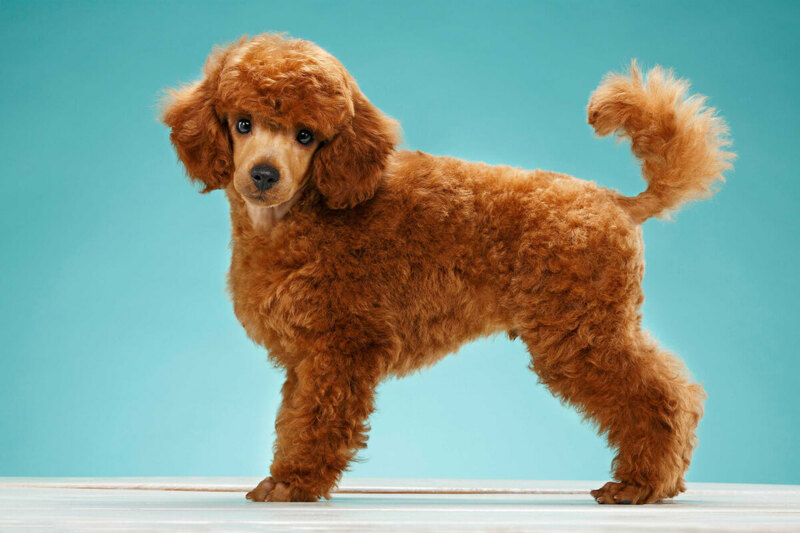 The American Kennel Club categorizes these dogs as Poodles between 10 and 15 inches in height. You can expect an adult to weigh between 12 and 18 pounds. The Miniature Poodle has no variations as this distinctly described dog is itself a variety of the Poodle breed. (The other three varieties are the Standard, Moyen, and the Toy Poodle, and the Mini is between these latter two.) 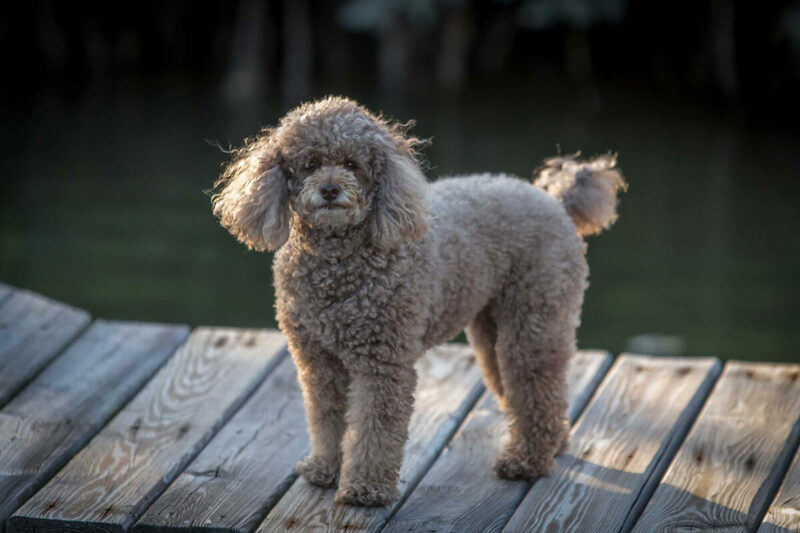 There may be large Miniature Poodles as well as small Miniature Poodles; the AKC, however, clearly defines a Miniature Poodle as being "15 inches or under…with a minimum height in excess of 10 inches." As such, there doesn't appear to be much wiggle room let alone reason to create sub-variations. This breed is known to be very smart (some experts say the Poodle is the second smartest breed), proud, and eager to please. Therefore, these dogs should be rather easy to train. They are also very affectionate and crave attention; they will not be happy if left alone or excluded from the family. The Miniature Poodle is very active around the home and will implore you to play games like fetch - if these dogs are left to their own devices they will become bored and may begin to act out in undesirable ways. Though these dogs do get along well with other people and animals it is still crucial to socialize and train them from a young age; Miniature Poodles that do not receive this type of training may become paranoid or neurotic. 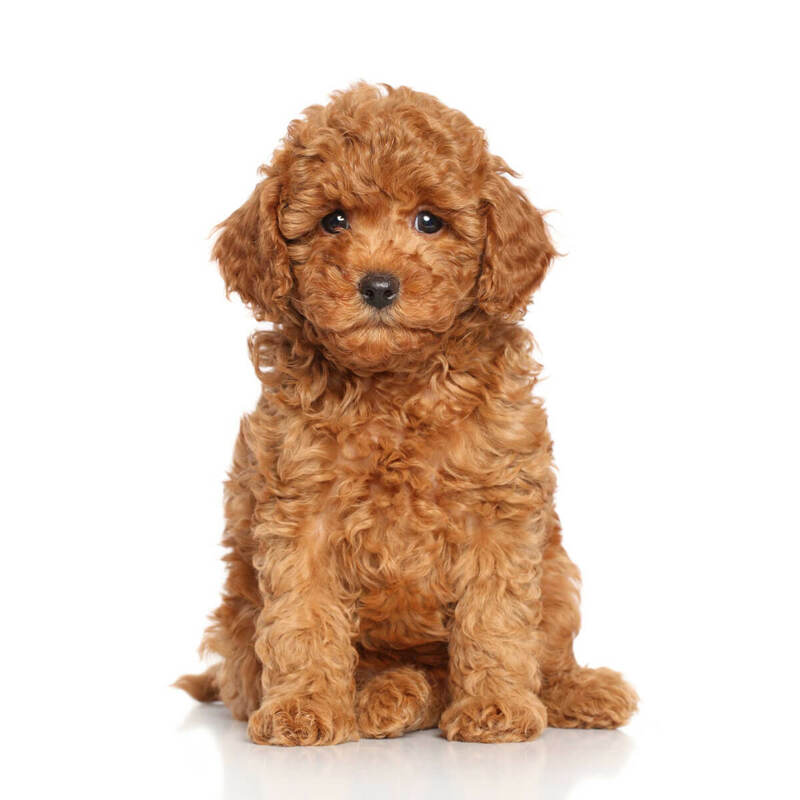 A properly raised Miniature Poodle will be a bright and cheerful companion, fun for the whole family. 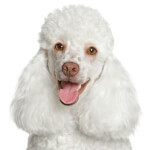 Poodles have been around the family since their inception and have no problems with children. Given the smaller size of the miniatures, the risk of kids being hurt is minimal, but the Poodle may be at risk if roughhousing is taken to the extreme, so small children should not be left unattended with these dogs. This breed should have no problem living with other pets, though, as with any dog, it is still important to socialize at a young age. These dogs are not aggressive towards strangers but are known to bark. Socializing puppies with many people from a young age may help to alleviate this tendency. Below are pictures and images of the Miniature Poodle dog breed. This is a high maintenance breed. Poodles will need their hair cut more often than most breeds; some say that Poodles are the most expensive breed to maintain of all. The upside is that they are non-shedding and hypoallergenic and as Miniatures their exercise needs are moderate. This breed needs to be trimmed and cleaned fairly often. 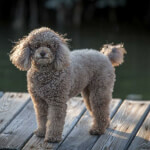 Most owners take their Poodle to a professional groomer every three to six weeks, though they can be cared for at home if the owner has a great deal of time and patience. 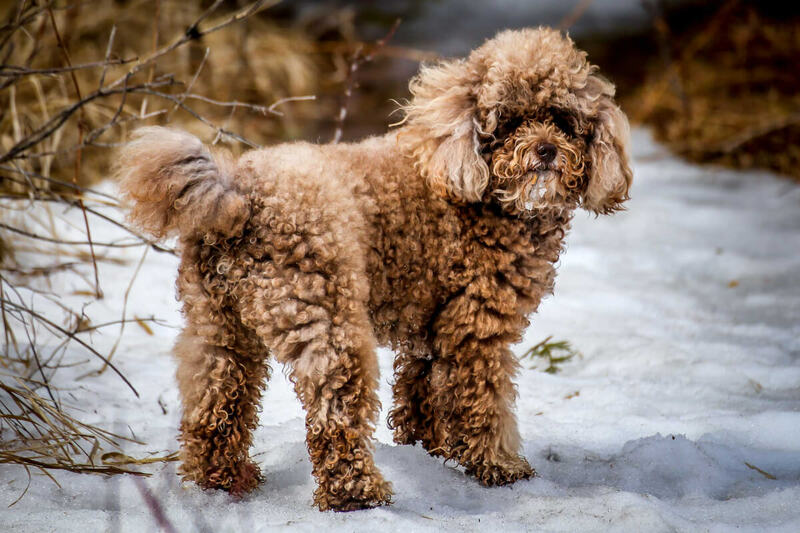 Brushing will need to be done every day - Poodle's hair doesn’t shed, it just collects in the coat which creates mats very quickly if not cared for. These dogs have fast growing nails that need to be trimmed regularly. Ears should be checked often for any signs of infection or debris buildup, and teeth should be brushed frequently (twice a week or more) as well. 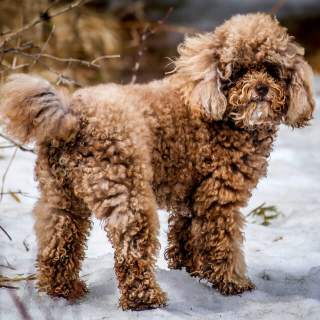 The Miniature Poodle is fairly active inside and will only require a moderate amount of exercise in addition to its daily romps around the house. A short daily walk of about 30 to 45 minutes will be sufficient. These dogs, small as they are, are capable of living in just about any environment, be it an apartment or large house. Their main requirement is that they be allowed to stay inside with the owner(s) and not be left alone outside. When these dogs are outside, make sure they are fenced in, as they are capable of running off or being injured by other animals. These dogs should not be kept outside in extreme temperatures, as they are liable to overheating. Poodles are considered to be a healthy breed; the most common cause of death for this breed is old age. There are, however, a few serious health issues that the breed is prone to, namely: Addison's disease, gastric dilatation volvulus (bloat), epilepsy, and hip dysplasia. Do not exercise the dog vigorously after meals. If kept healthy, miniature poodles have an expected lifespan of 14 - 15 years.